The retooled 5 series, pictured, hit European showrooms in March. BERLIN (Bloomberg) -- BMW said orders for the revamped 5 series have “considerably” exceeded the carmaker's own targets. The automaker is aiming for a “sound” single-digit increase in sales in 2010 to more than 1.3 million cars, CEO Norbert Reithofer said Wednesday in Munich in a speech to shareholders. 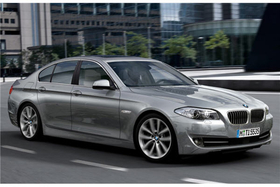 The latest-generation 5 series went on sale in Europe in March. BMW is sticking to its forecast of increasing 2010 earnings “significantly,” Reithofer said. After its automotive division lost money last year, BMW is targeting an operating margin from automaking in the “lower one-digit percentage range,” he said. BMW, which toppled Daimler AG's Mercedes-Benz as the largest luxury carmaker in 2005, has increased sales 27 percent since 2000. The manufacturer has a medium-term goal to boost earnings before interest and tax from automaking to at least 8 percent of sales by 2012. “There are still numerous risks that might prolong a complete recovery,” Reithofer said at the company annual meeting. With Greece's financial problems and the EU's efforts to stabilize the euro, “we see that the crisis is not over yet,” he said.